I’m still asked on a daily basis why I prefer a 7-inch tablet over a larger sized device, such as the 8.9-inch G-Slate or 9.7-inch iPad 2 (s aapl). While personal preferences will vary, I enjoy the portability of my Samsung Galaxy Tab. It’s small enough to take anywhere, fits in a jacket or back pants pocket and offers an improved experience over smaller-screened smartphones. Others will disagree, and that’s okay. But for all of the “there’s no market for a 7-inch tablet” talk, I see plenty of recent activity in this space. Although I’m running an unofficial version of Froyo on my current Galaxy Tab, Samsung is now rolling out an official Gingerbread update to device in Italy. It’s a safe bet that other regions will see the same, although Samsung hasn’t published an update schedule. The 7-inch Galaxy Tab has voice calling capabilities in addition to 3G data, so regional-based carrier testing is likely required, which could slow the software rollout. Sadly, this update is reportedly for version 2.3.3 of Android, which isn’t the most recent version of Gingerbread. My hope was to see the next Gingerbread version, 2.3.4, on the Tab as it brings video chat though Google Talk. Since the Galaxy Tab has a front-facing camera, that functionality would be a welcome addition to the device. My expectation is that the current 7-inch Tab won’t see additional major updates, at least not officially. 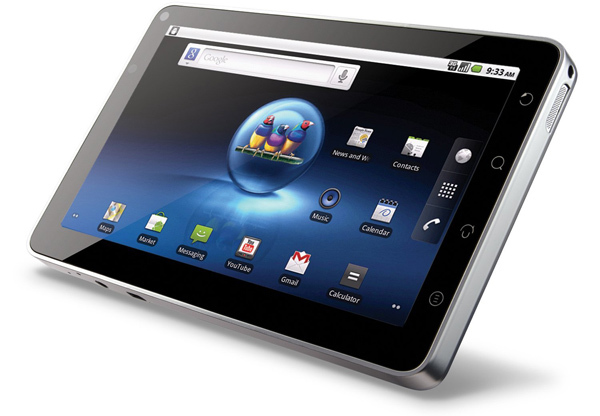 All the new tablets arriving now pair Android 3.0 with more-powerful dual-core processors than the Tab. I suspect the same will officially hold true for Android Ice Cream Sandwich, a version of Android that will unify the platform for both smartphones and tablets when it arrives in the fourth quarter of this year. Acer’s Small Honeycomb Slate Delayed? One of the first companies out of the gate to announce a 7-inch Honeycomb tablet may be slowing up a bit. Amazon’s (S AMZN) U.K. page for the Acer Iconia Tab A100 originally displayed a May 14 launch date, but the Carrypad blog says Amazon now shows a June 30 date. In some sense, the tablet can’t technically be delayed if Acer didn’t officially announce a launch date to begin with, but folks hoping for the device sooner rather than later may have to wait a bit longer. I’ve reached out to contacts at Acer for an official statement and will update with a reply. Earlier this year, some blogs reported the device would launch by the end of April, so there’s clearly some confusion. Regardless of the actual launch date, I’m looking forward to seeing how Honeycomb works on a smaller screen. Due to the application fragments supported in Android 3.0, optimized software should work well on either small or large tablets. Apps will switch to a list view when a carousel view won’t fit, for example. Performance-wise, the A100 should handle Honeycomb nicely, as it’s expected to be powered by Nvidia’s Tegra 2 (s nvda) dual-core processor. With a potential delay from Acer, the first 7-inch Honeycomb tablet may come from Viewsonic, according to PocketLint. The site reports Viewsonic will debut the ViewPad 7x at next month’s Computex show in Taipei. The company already makes a 7-inch slate in the ViewPad 7, but, like my Galaxy Tab, it runs the smartphone version of Google’s Android operating system. Details on the new tablet are scarce and will likely become available at Computex, but PocketLint has some information: Android 3.0, dual-core processor, front- and rear-facing cameras, support for HSPA+ mobile broadband, HDMI support and a weight of 380 grams, making the device highly portable. HTC’s Flyer is likely to hit the market before the ViewPad 7x — the device can now be pre-ordered in Europe — but the Flyer comes with the Gingerbread version of Android. HTC says Honeycomb will be available as a future update. While I wouldn’t expect these 7-inch devices to rival Apple’s iPad 2 in terms of sales, there’s a growing interest by manufacturers to keep advancing 7-inch slates. Adding voice capabilities to the devices can bring both the smartphone and the tablet experience in a single device. You wouldn’t want to hold one of these up to your head for a call, but Bluetooth headsets, as well as wired ones, work just fine for the 7-inch slates market that isn’t quite dead yet. Hello! Im in the market for a 7inch tablet… Actually, i aint got any money (yet), but i am planning on saving some to buy a 7inch ANDROID. Ive been an android user for around 2 years. I had a G1, rooted and used CyanogenMod Eclair, and then Froyo. I switched my phone for a Motorola Droid X wich ive rooted with Liberty Gingerbread nightlies. So, ive been looking at getting myself a nook color. I know its the same 512MB, and a smaller 800mhz proc… Same screen size (7″), same screen rez (1280×700), but at $249 bucks, its a real bargain. The main deal here is, that in mexico, we aint got nooks, so id have to “blind-date it” and ask for a friend or sibling to buy it for me when he/she visits the US. While i can get the Galaxy Tab here for just a little more money than i would get it in the US. So, you see my dilemma… Could you help me out here? It is easy to check if there is market for 7”. Question is if there is a market for 14” (if weight can be reduced to reasonable value) which embrace standard A4 format ;). 7″ tablet will happen eventually when Apple gets out of its “denial mode”. Remember that the whole tablet phenomenon is only a year old. Last summer, my daughter & I spent 3 weeks in Europe with just 1 ipad for email & calls (via skype). we went thru a zillion museums and cathedrals with tour books and maps loaded into the ipad. Only complaint we had was that the ipad was too big to lug around every day. 7″ tablet would have been perfect. It is very complementary to the 10″. I now carry both the Galaxy Tab and the iPad. Would certainly stand line to buy a 7″ ipad if and when it launches. I loved my7″ tablet until I got an 8″ tablet. Then I got a 10″ Xoom.. and that is where I am at http://www.TheXoomTablet.info. Once again, you are sharing a wide vision of the space that we usually aren’t able to see. The 7″ form factor is also idealy suited for medical use. You can easily stick it into a lab coat pocket, whereas I see other physicians hand carry their iPads, cocooned in the protective sleeves since the chance of dropping it or misplacing it greatly increases. The 7″ form factor simply lends itself to higher usability at the bedside and in the clinical arena where you need the info right then and there. It is, in my opinion, right at the “sweet spot” for the medical environment. Was reading it today for the first time as a speculation from some blogger and can’t stop thinking about it. A 6″ Android by Amazon. WOW. 6″ – great speculation given their curr sizes. Might be the ultimate device size. Drooling now. 6. Stretch … phone capabilities? 2. wifi + 3G + GSM. I have use the Fujitsu U810 with 5.6inch without the need to zoom in. I think 6″ may be stretching my pocket but would not mind it. However, I fear manufacturers view us as ‘niche-geek’ market which is why their reluctant to enter this screen size market. My only support to manufacturers are that if this size market succeed in capturing tablet, phone, mid and music player, they can capture the entire market. Could not agree with you more, Kevin. Whenever I see an announcement for a new tab, the first thing I do is look at the size. Over 7″ and I don’t bother to continue reading. 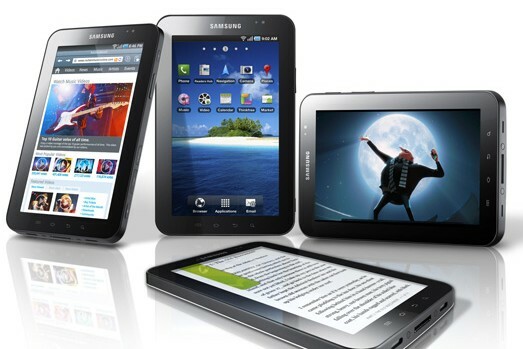 Right now I’m deciding between Samsung’s Galaxy Tab 7 and the Infuse (4.5″). Here’s the thing, I carry my phone with me wherever I go but I also tend to carry a print book with me. I’d let to get that down to one less brick in my bag. The reasons I never pulled the trigger and bought the Galaxy Tab are that it’s not a phone and I worry whether Samsung will continue to update it, leaving me out of the future apps market. BTW, Kevin, if I were to purchase the ATT Tab version (rather than wifi only), do you know if I’d be able to sideload apps from non-official sources? The reason I haven’t decided on the Infuse yet is that I’m worried that the screen may be a tad too small for heavy-duty reading with my tired old eyes. I stopped reading ebooks a couple of years ago because my old HP iPaq PDA began to give me hella eye fatigue. I’m hoping the Infuse will show up in my local ATT store next week and I can check it out. BevL, I was joking with my son the other night about the Infuse, saying it’s like a large type book for folks with bad eyes (like me!). I highly recommend taking a look when the device hits stores on Sunday. As far as the AT&T Tab version, I don’t believe it officially allows for sideloading apps, but I’d verify that in store. ATT Galaxy tab will not allow download from any site other than “market”. Received mine 2 days ago and can verify that is factual. Need to ask Kevin what custom rom he has installed and do likewise. I would guess using custom rom will allow “side-loading”. BTW att wireless has some refurbished Galaxy tabs at a reduced price. Price is not the cheapest, but thanks to Steve Jobs, no contract and fair data package pricing (since att is using Apple data pricing on Galaxy tab). I’m a fan of the 7″ size for portability too, and while I’m glad to see that Samsung are not abandoning their (loyal, early-adopter) customers, I hope it doesn’t stop here. I actually believe the device would run Honeycomb very well. From what I can see, the GPU is just as fast in practice as Tegra 2, and the processor is plenty good enough. In fact, running the GTab on a custom kernel which uses the ext4 filesystem (and overclocks to 1.4), is lightning quick – any 3.x upgrade would at least apply the former improvement. Honeycomb would give the device unified storage space and MTP, too – that’s a huge win. Oh, and remember the HTC Flyer is running a single core, too – and that’s officially planned to receive 3.x. We’ll probably only ever receive support after this from the community though, which is a shame because of the restriction on the 3.x source code at present. wasnt this the size that was declared DoA by Steve Jobs? Yes, but he also said he would never make a tablet either. one thing to add for the galaxy tab 7 inch is the education for toddlers, i bought 2 for my toddlers.to learn maths and english and with the weight and size and flash support it is perfect for them. I second the pocketability test but I want 7″ Win7 tablet. I moved from a 5″ OQO (that died) to my 8.9″ HP Slate and, while it’s great in the office and on the couch, I’d need clown pants to put it in my pocket. The OQO’s screen was, admittedly, too small for real work but a 7″ screen would be perfect. To put it in paper terms, my Slate is about the size of a steno pad while the Galaxy Tab is more the size of a reporter’s notebook. It’s easier to grip with one hand and write with the other in portrait mode plus it’s lighter. Landscape mode still gives you enough real estate for reading of surfing. Unfortunately, while a number of Android companies are moving towards smaller devices, all the Windows devices I’ve seen are gravitating towards 10 or 11 inches. I would guess there are a few reasons why tablets sold in the USA generally don’t have voice enabled. The obvious one is the carriers would rather sell you two contracts instead of one. Another reason is the FCC. There is a lot more testing and filing required for telephone device than a mobile broadband device. There is also different standards for the WiFi only versus the mobile broadband. Many laptops and tablet PCs have an internal data card that could easily support voice calling. Some of the mobile PC cards have an input for a headset and allow voice calls but mostly it is deactivated in the firmware. Other countries have different requirements so they can add those features without any problems. When everyone starts making pentaband 3G then there could easily be a bigger ‘grey market’ for voice-enabled tablets. Not sure how how this news = market for 7″ tablet. Anticipated market, maybe; hoped for market certainly. But this news is woefully short of actual evidence for a market and very long on a desire for there to be a market. That desire is understandable: it’s a chance to stand in a niche where Apple is blocking out the sun. Fair criticism. I don’t think the OEMs would invest the time and money in these devices if they didn’t see a market for them, but your point is well taken. There may well be a market for 7″ tablets, only time will tell. “I see plenty of recent activity in this space” — aka some manufacturers are or might be building them — doesn’t counter â€œthereâ€™s no market for a 7-inch tablet.” That would require actual sales. Right on Kevin. Seven inch is awesome. I actually use my galaxy tab as my only online device and call out on Skype. This is great deal considering on att its 25 per months plus free text on Google voice. Not sure why anybody would pay over 70 for a phone that does less than a tablet. Guess phone companies will catch on soon can’t imagine they like me saving over 45 per month and having a better experience on my galaxy tab. All good points, Sean. I think the bigger names are trying to “chase” the larger iPad size which has left opportunity for others. Will that opportunity pan out? I don’t know, but I’m hopeful as I see tablets of this size taking the place of a smartphone for some. It already has in some cases. 7″ may be the upper boundary for me. And 5″ is probably the lower boundary. Anything in between can prove just the right thing. Thanks for the update Kevin. Been reading daily on these options too lately. What is important in my opinion is the fact that the purpose of the device is to be a primary option on the go. Dont forget about Viliv, upcoming Amazon & new Nook. The 7″ category is strong & will only get stronger. While I would never expect it to sell better than the 10″ especially in “bigger is better” america just like ultraportables (& netbooks) never outsold mainstream laptops. I would love a 7″ android tablet with voice and a 1280Ã—720 resolution. This device would lose money, not for you and I, but for carriers and they would prefer you to have multiple contracts on multiple devices. So do I ever see this happening, absolutely not. You forgot to discuss Blackberry Playbook. Fits my jacket pocket quite neatly – it’s about the size of a paperback, except thinner. The Playbook has been a big disappointment to me. They tried to be innovative with using the edges much like the Palm Pre did in adding extra navigation functionality off the screen but on the Playbook it was so erratic it made using it very aggravating. At first I thought maybe it’s just not calibrated so I tried 2 other demo units both were as buggy as the first. I will have to say the Playbook unfortunately gets a big thumbs down. Oh well, I guess we’ll have to see if HP/WebOS can give the Tab and iPad some real competition. Kevin, I’m with you. My brother-in-law picked up an iPad2 recently and tossed me his Galaxy Tab and I love it. It is an international unbranded version so I’m hoping I’ll get official Gingerbread shortly. Might plug into Kies tonight and see what there is. 7-inch is where its at if you plan on taking the thing out of the house.